I recently had the idea if I should stream some LunaLua live development. Just say if you would be interested or not. Heya all, I'm here to present Lunadll with Lua (Alpha-Version)! I used most of the last week to work on this, and I think it's turning out pretty well. The problem with Autocode (the lunadll-language) is the lack of flexibility that it has (such as the way it lacks custom functions, variables,... etc). Kil is currently developing his own language, when he provides me the source code I would merge it together with this lua part. With this we don't need any hardcoded code for complex ideas anymore. So first of all: What is lua? You might want to google other lua tutorials too. 1. Check "Full Installation", check all checkboxes and download the most recent package. 2. Extract the package and profit! 1. Check "Only Update" and replace the LuaScriptLib and lunadll.dll in your existing installation. Examples are provided in the reference page. Which lua-libs can I access? os. * Note: Only os.clock, os.time and os.date works. The rest is limited due security reasons. Last edited by Kevsoft on 28 Oct 2015, 17:30, edited 64 times in total. 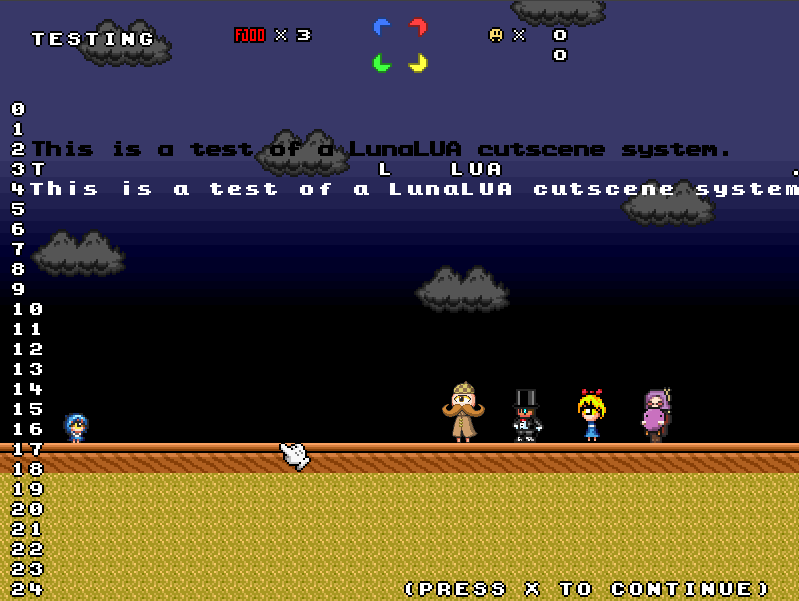 Re: Presenting: Lunadll for Lua! A friend of mine, the same that made the Luna.txt help program, has been experimenting with this, he made a fully working dino rhino torch thingy, and added a double jump to yoshi! Darkonius64 wrote: A friend of mine, the same that made the Luna.txt help program, has been experimenting with this, he made a fully working dino rhino torch thingy, and added a double jump to yoshi! This sounds pretty awesome. Would it be possible to change the player jumping/running physics to SMW ones with the help of this thing? 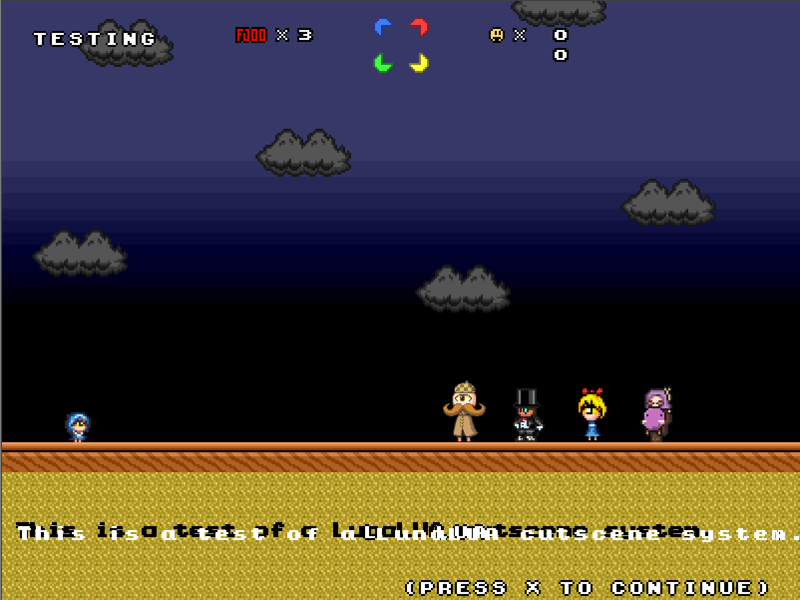 -- Can the player press the key to skip the current line? -- Does the dialogue halt the cutscene timing? -- Does the player have to press a key to continue? -- Can the entire cutscene be skipped? -- Decrement the dialogue timer. -- While the dialogue timer counts down, display the dialogue. -- When the speaker timer reaches zero, reset the speaker. To use it, include a processNPCTalkAnim() command in onLoop for each NPC ID you want to animate, then add timedDialog() commands to processCutscene to create a sequence of subtitles and character animations. You can use setDialogRules() to control how dialogue flows/progresses. The NPC sprites can have any number of animation frames, but you'll want at least two so you can specify separate frames/ranges for idle and talking animations. Again, I'm not super Lua-savvy, so apologies if there are any syntax errors or other major issues here. Hopefully this thing'll aid folks in making more cinematic cutscenes; at the very least it should help clear up issues people have with identifying which character is speaking, as has been the case with Youtubers being introduced to the siblings for the first time. Last edited by Rockythechao on 22 Sep 2014, 14:28, edited 6 times in total. There are some syntax errors. Lua is case sensitiv with functions and variables. Arright, fixed some misnamed variables and incorrectly-formatted hex addresses, added the  (not really sure what I was thinking trying to do that to the whole array), changed some of the spacing to be closer to the examples. Did I miss anything? Lua unfortunaly doesn't support one-line if, for, function and while-loops. You always have to close them with the 'end' keyword. DON'T PM me. Ask your question in the help thread so everyone can be answered. Ah, thought I capped off all of those, guess I missed a few ends. Yeah, had I been using a proper IDE I would've caught those, but admittedly I haven't set everything up yet for incredibly dumb reasons -- I had trouble getting LunaDLL to work in the past so I was kinda worried that I'd end up spending all my free time on the installation process the DLLs and never get around to actually working with it. That said, I've probably spent more time on this back-and-forth thingamajig than it probably would take me install it, and now I'm out of time. I'll get back to this thing this weekend. Thanks for the help and apologies for the trouble! More details in the video description. * Added event support for player 2. * printText now auto-uppercase the text. Dangit, I took too long to reply! ...but I haven't been able to get Font 1 to work for whatever reason. I don't know if it's just an issue on my part or if Font 1 simply doesn't work in LunaLua, but unless it's the latter I don't recommend auto-capitalizing displayed text. At least not for fonts besides #3, anyway. On another note, can this extension (I'm just gonna call it LuaLuna from now on) reference the level directory like LunaDLL autocode can? It would be great if we had the option to use file names for playSFX in addition to indexes, and there's so much that could be done with LoadImage and PlaceSprite. In general, it'd be helpful to have a list of planned features as well as which LunaDLL functionality, if any, can't be implemented in LuaLuna for whatever reason. Font 1 should be able to display small letters. It's the smbx font used for level names. Only problem is that that font is black, so it's ugly. ALso that's a cool cutscene thing. ...So I tried something. I set up a simple loop and iterated through fonts 0 to 6. I'mma do it 30 times or more and see if there are any others tucked away in there. Also past me, that's not how you spell "LuaLuna". Wait, there's a 4th font I never knew about? ... God damnit. Yep, I thought the message box font was just the overworld font inverted but I guess it's a different thing altogether. EDIT: The animation stuff is mostly working now. I can't get characters to stop jittering when I specify a single-frame loop, but as long as the max is greater than the min it works perfectly. I'll record another video once I get text wrapping to work. Last edited by Rockythechao on 25 Sep 2014, 01:28, edited 1 time in total. Rockythechao wrote: Yep, I thought the message box font was just the overworld font inverted but I guess it's a different thing altogether. Looks to be a monospaced version, probably to make fitting the font to the text box easier. Oh, one more thing! Does version 0.2.2 (not gonna update just yet due to autocaps) process both Lua and autocode or just one or the other? I remember seeing something in the LunaDLL help thread about it disabling one if the other is detected, but if it allows both I'mma try out some HUD stuff.